Farmers were expected to begin receiving Black Belly sheep under the poverty alleviation programme this week. Seventy-six sheep arrived in the state in December and are to be distributed to farmers who were adversely affected by the decline in the banana industry. âWe are looking to address the issue of poverty. 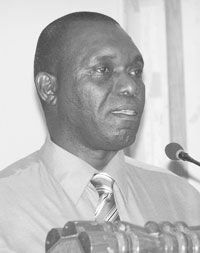 Farmers who would have plunged deep due to issues in the banana industry, we will provide livestock and help them to up their game,â Chief Agricultural Officer Reuben Robertson explained. According to Ministry officials, over 500 sheep were ordered at a cost of EC$200,000, with each farmer receiving one animal. Funding for the poverty alleviation project was made possible through the Petro Alimentos Programme. Black Belly sheep were chosen because of their ability to have multiple offspring. Those receiving animals will be required to give one back to the Ministry. The Chief Agricultural Officer said that the commercialization aspect of the project was still being fleshed out. However, there were other areas that the Ministry will be exploring within the livestock sector other than small ruminants such as goats and sheep. âWe have taken a policy decision where we are going to extend the hatchery for more eggs as we are going into broiler production,â he explained. Robertson said that it was anticipated that this would meet at least 75 per cent of the current demand. Broiler production was taking priority for 2010 Robertson said. As for the larger animals: pigs and cattle, he said that the Ministry was working in partnership with the Food and Agriculture Organization (FAO) to develop a meat processing plant specializing in meat cuts and minced meats. âWe will have to redouble our efforts,â added Hon. Montgomery Daniel, Minister of Agriculture, noting that this was needed from all stakeholders throughout the sector. âCompetitiveness is important,â Daniel explained.